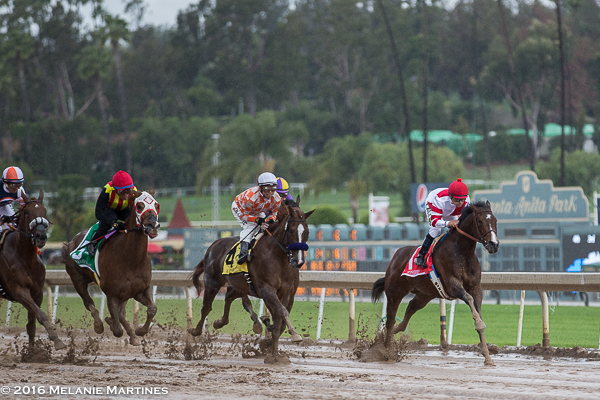 If anything was on the money, it was the weather forecast for the 79th Running of the Santa Anita Derby. Mother Nature was not on our side, and made it for a very cold and rainy day. Yet, 27,821 race fans came out for one of the biggest race days of this meet! Racing fans equipped with umbrellas anticipated an exciting day of racing. 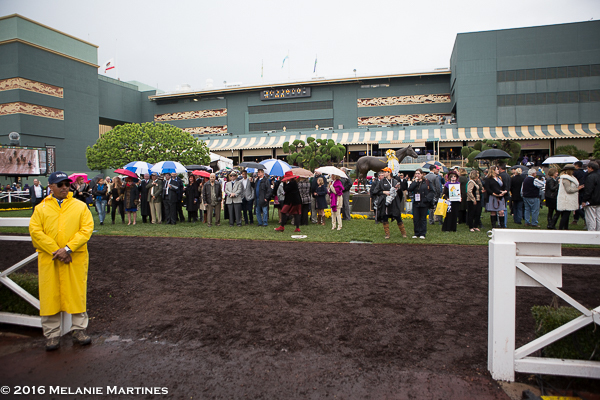 With 12 races on the card, and some nice looking fields; rain could not damper the excitement at The Great Race Place! 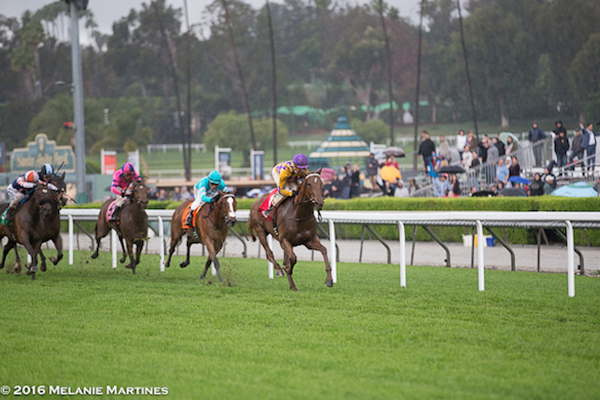 Graded stakes action started with Race 5. 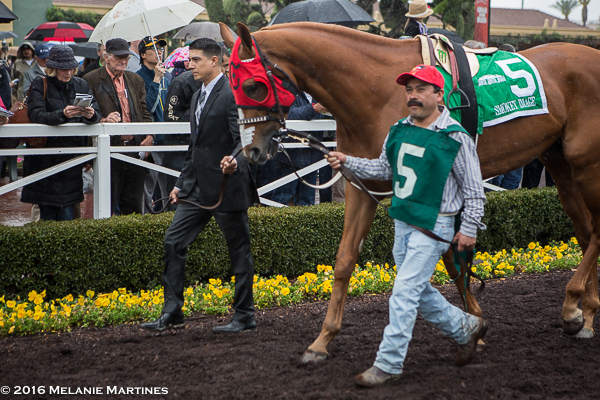 The 36th Running of the Grade 3 Providencia Stakes. Turning for home #7 Jeremy's Legacy at 19-1 took the lead by 2 1/2 lengths, but out of nowhere flying late from the outside from last was #1 Decked Out in-hand to win very impressively. Decked Out and Jockey Kent Desormeaux, from last to first. 19-1 Jeremy's Legacy held on for second, with Nodiac coming in third. 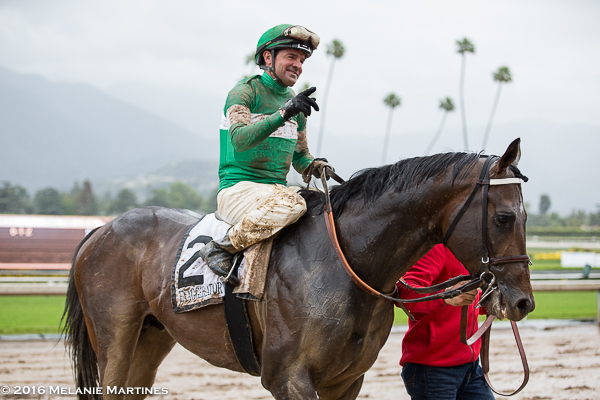 Thumbs up from Jockey Kent Desormeaux. 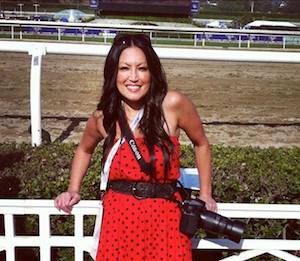 I'm always excited to see race fan, Dawn at the Santa Anita Park. 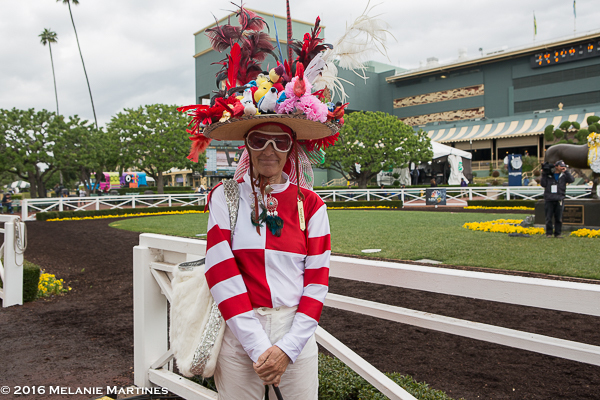 Here she is sporting her Songbird outfit. There are a lot of tiny birds that she's added to this hat. Very cool outfit, to even include a Songbird name-tag. I checked to see how heavy it was... It's pretty heavy! 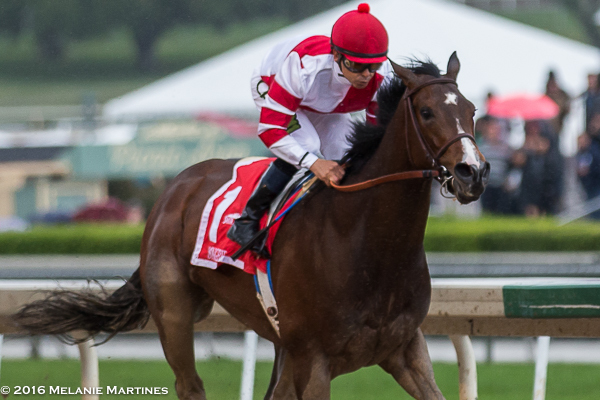 Finally here she comes...leading the way, Fox Hill's Farms' Songbird. 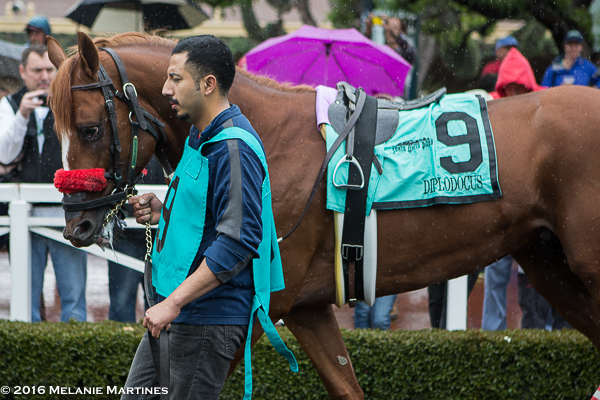 Possibly the best 3-year-old in the country heading to the Saddling Area for Race 7. 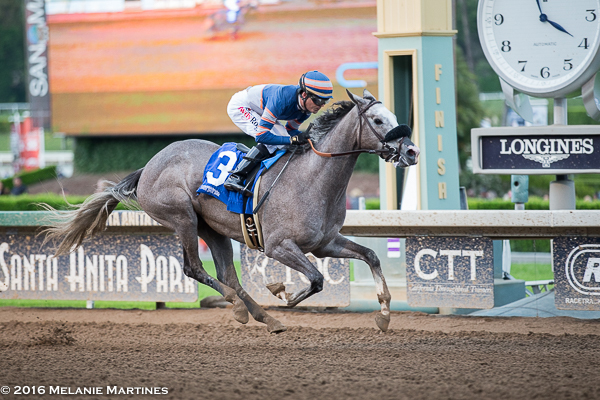 Jockey Mike Smith, "She was spinning her wheels a little bit going into the first turn, but once we got to the backside, she found her rhythm, and she got comfortable and it was all her again." 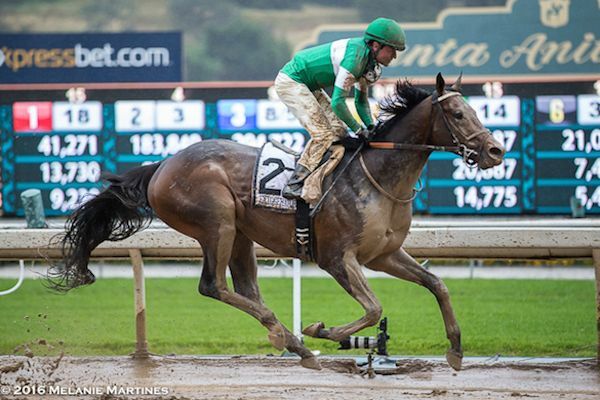 Jockey Mike Smith canters home with super-star filly. 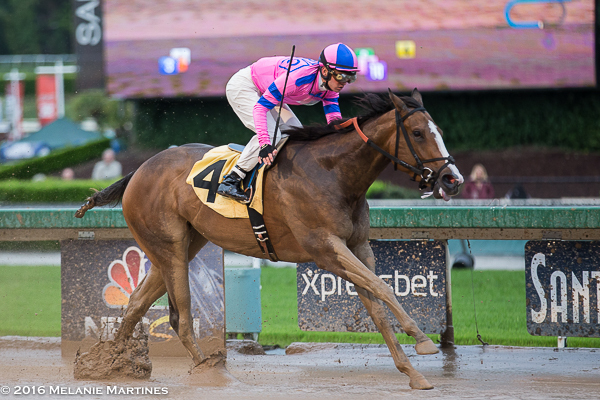 Trainer Jerry Hollendorfer, "I was confident going down the backside that she was handling the track fine and I thought if she could finish, she could win." 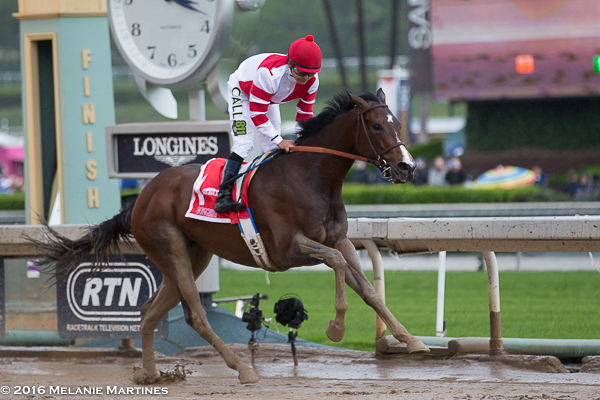 Songbird continues her perfect record, 7-7. 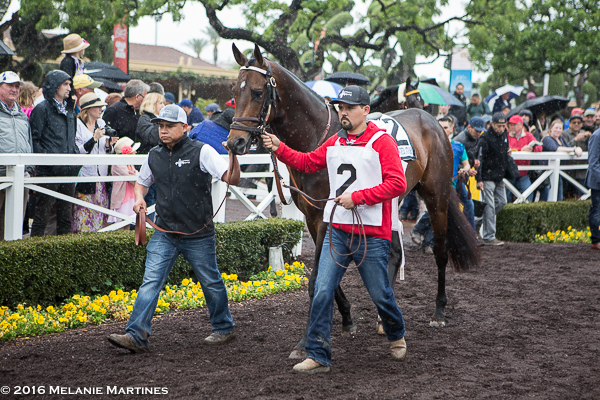 Connections in the Paddock area waiting for the Santa Anita Derby field. 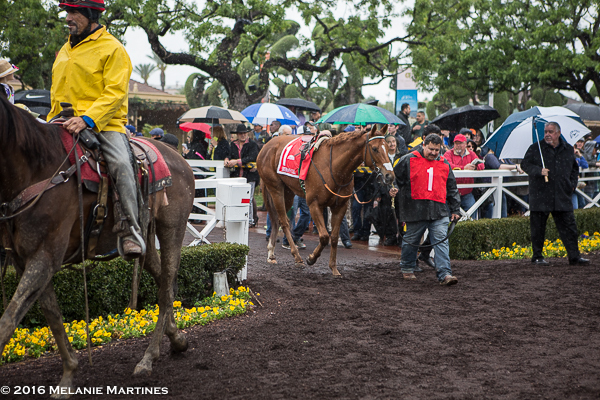 As the horses come out, it begins to rain. Here is Denman's Call. Weather setting up for Big Chief Racing's Exaggerator. 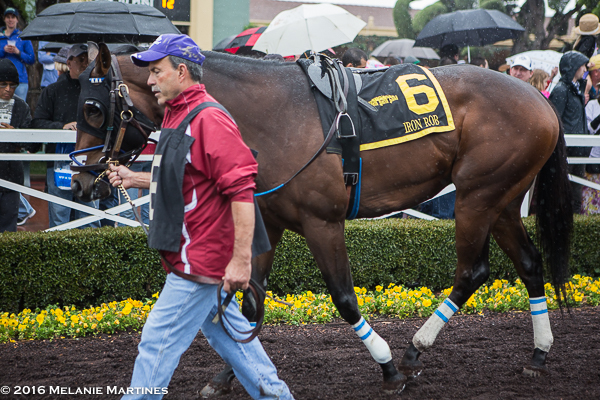 I was unable to get a clear shot of #3 Danzing Candy since he was a bit unsettled in the paddock area. 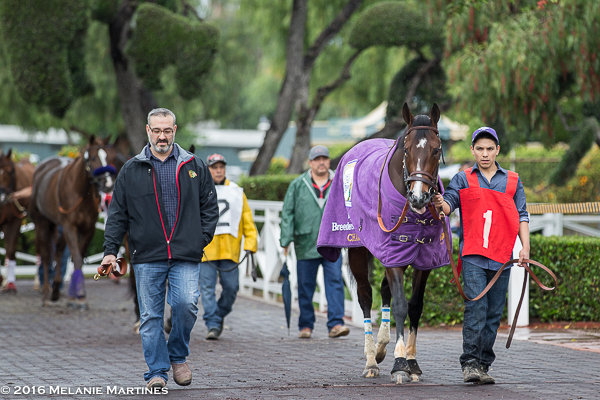 Here is Bob Baffert's trainee, Mor Spirit. 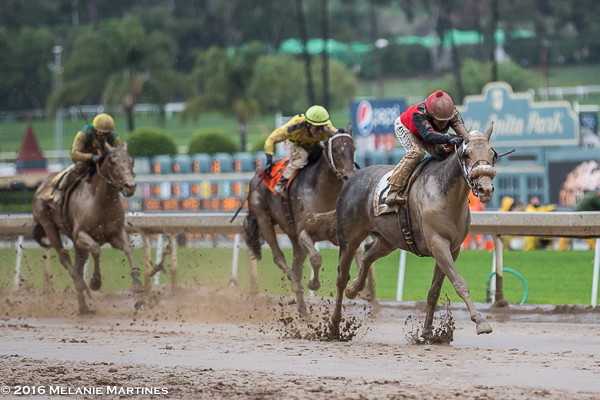 Smoky Image came in 5th in the San Felipe against 4 others in this race. 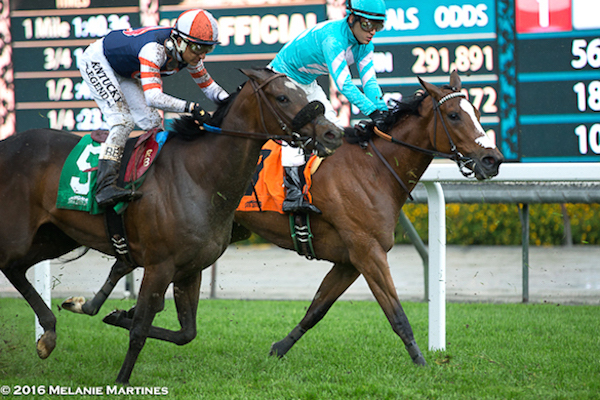 Iron Rob, moved up in class to run against graded stakes winners. Both Dressed in Hermes and Rare Candy was scratched. Diplodocus switches to dirt from synthetic surface last out. 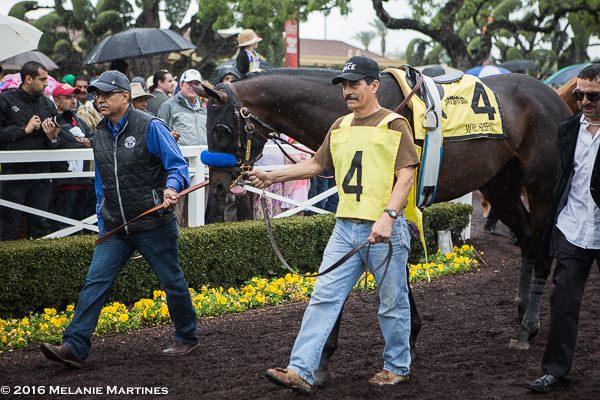 Uncle Lino looked fabulous in the paddock. Very good-looking colt. Here is Danzing Candy looking like he's having a miserable day. 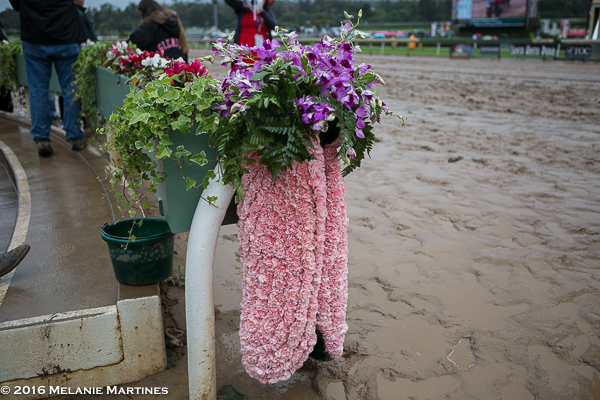 Blanket of pink carnations goes to the Santa Anita Derby winner. 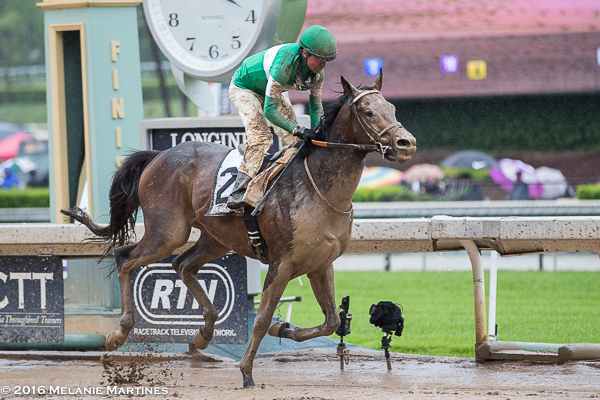 Exaggerator came around the final turn with a wide rally eating up the slop and zipping past the field like a speed boat. 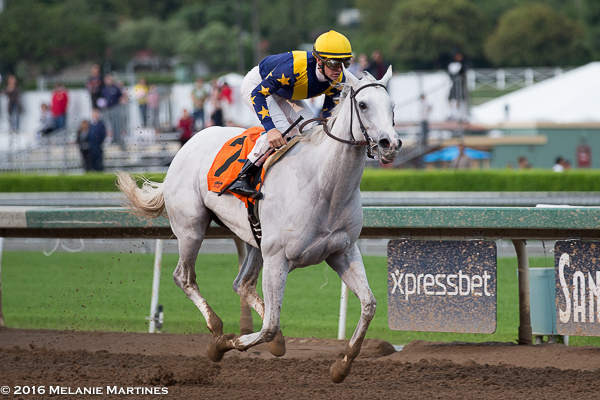 He splashed home convincingly posting a 103 Beyer, the best Beyer figure that a prep race has produced. 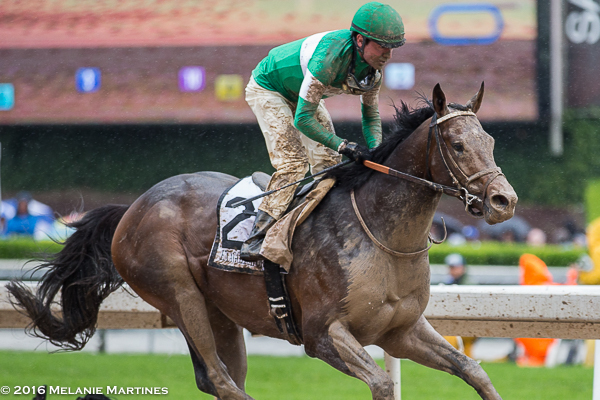 Romping home with 100 points added to the Kentucky Derby leader board, this 3-year-old mudder is going to the big dance! 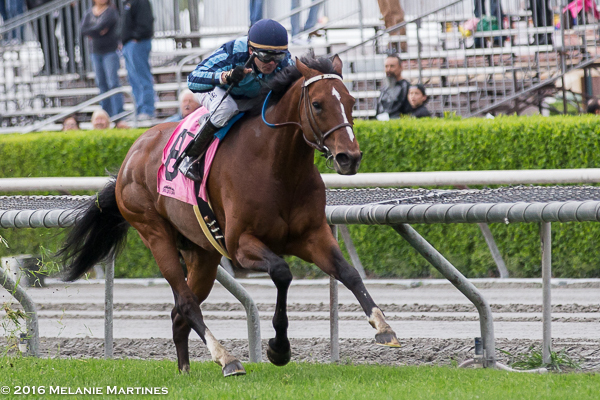 Jockey Kent Desormeaux, "Well, if he shows up the first Saturday in May like he did today...he was ultra-confident today. He's so mature and he walked to the gate like an old pony. He left there quiet and comfortable and I think that's the difference, when a horse lets you drive and they're not man-handling themselves." 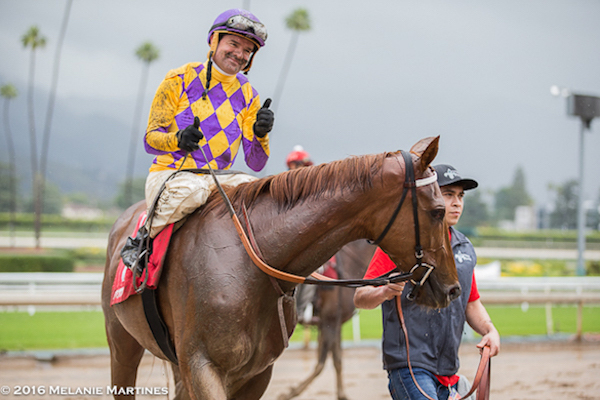 Jockey Kent Desormeaux, "He reminded me of Texas Red." There was intermittent rain with hopes that it would die off, but the rain would not stop. It just kept coming back. In Race 9, #12 What a View took the lead in the upper stretch and held gamely under urging to win the 12th Running of the Grade 3 Thunder Road. 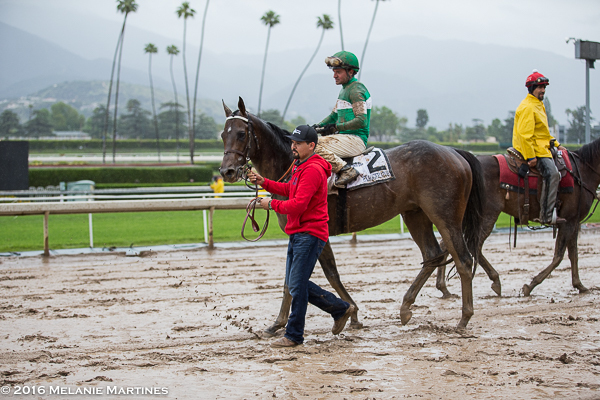 Jockey Kent Desormeaux having a great day with winner What a View! 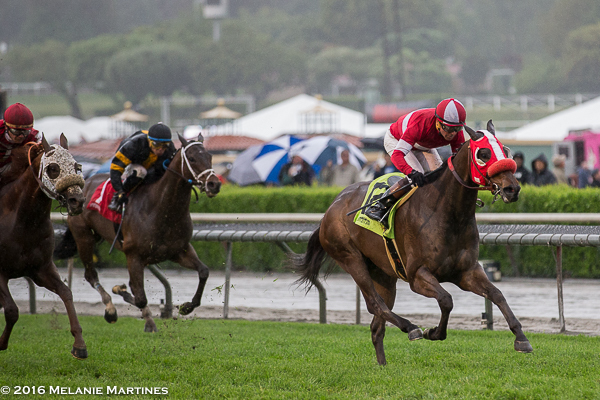 In Race 10, It was a slow start for #12 Tough It Out in the 5th Running of the Eddie Echo Stakes. He trailed the field, then gained momentum in mid-stretch as he went to the middle of the track. Here is sweeps past #7 Gold Rush. 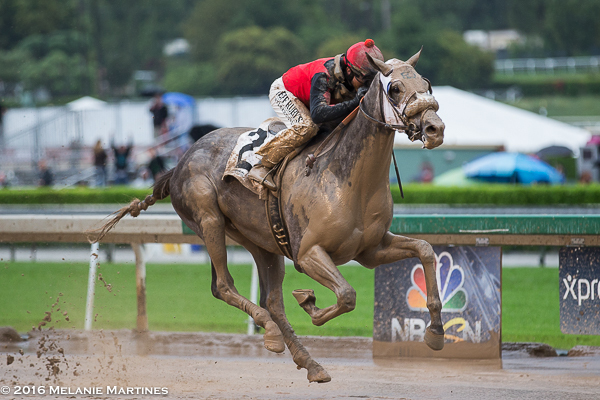 Jockey Joe Talamo and Tough It Out win impressively gliding over the mud! 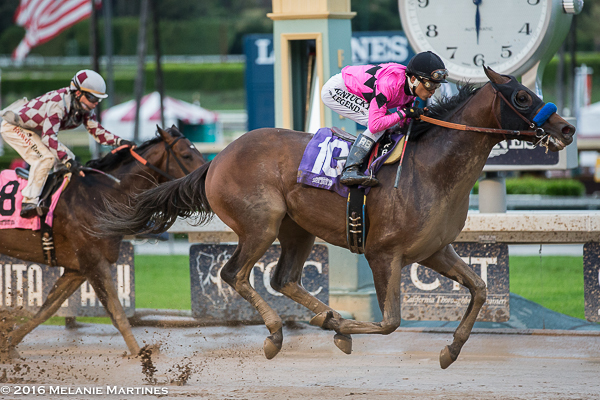 Race 11, The Evening Jewel Stakes. Pacific Heat was in the early action. At the half mile pole she took the lead flying home. The field was after her late, but she was just too good. Jockey Flavien Prat, "I prefer a fair track. 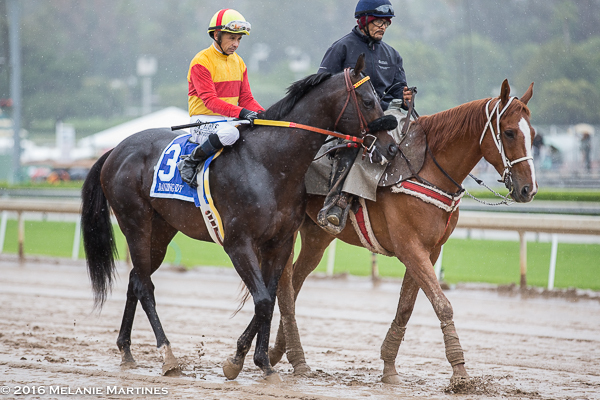 She wasn't really comfortable on this sloppy track today but she has so much talent that didn't even matter. Her talent made all the difference." 3-year-old American Freedom, a Pulpit colt out of a Pleasant Tap Mare looked like a major threat with Jockey Rafael Bejarano aboard. Sunday was a much better day at the track! I kept on saying, "Today, should have been yesterday." This was the aftermath from the torrential rain. 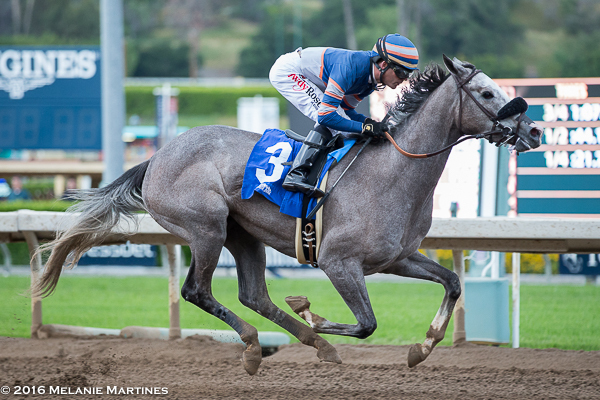 There were two graded stakes action for Sunday, Race 4 the 43rd Running of the Grade 3, Las Cienegas. The race was moved off the turf. 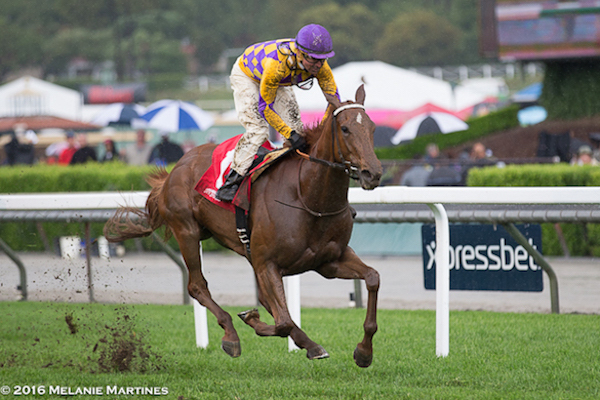 There could be many words to describe the winner, Dreamologist. 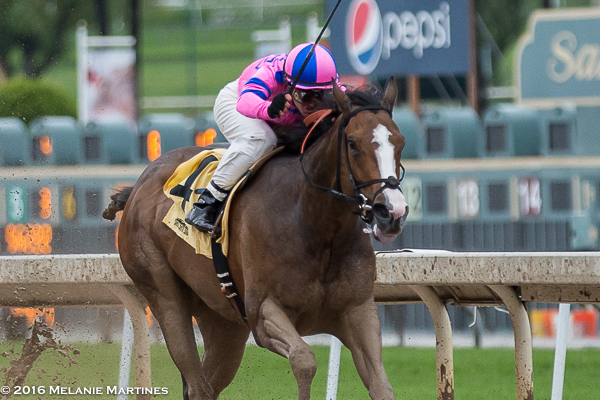 We could say she's dreamy, magical, mystical, but today this LNJ Foxwoods' filly took her turf talent onto the dirt and is a Stakes Winner! 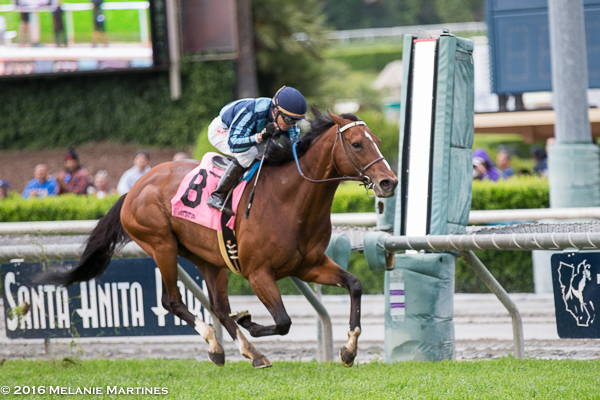 A tough test for this turf filly, but she proved best. With looks like this she could stop traffic! 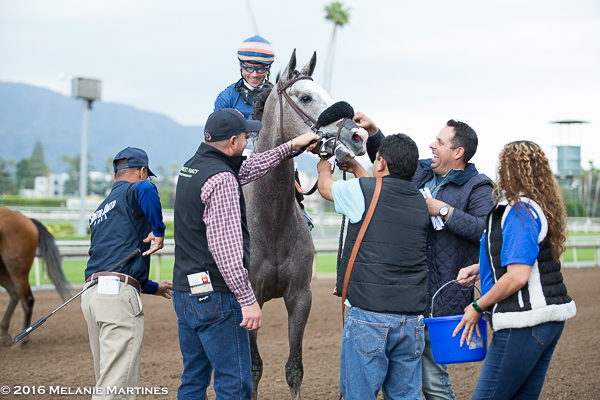 Jockey Flavien Prat is all smiles as he pets Dreamologist. 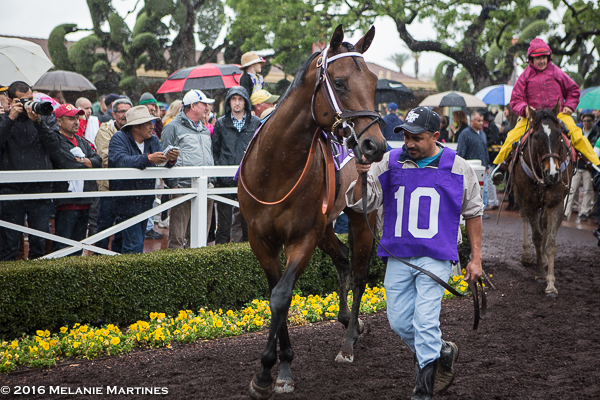 Race 7 was a Maiden Special Weight, but this filly is worth mentioning since she won impressively. Remember this name, Enola Gray. 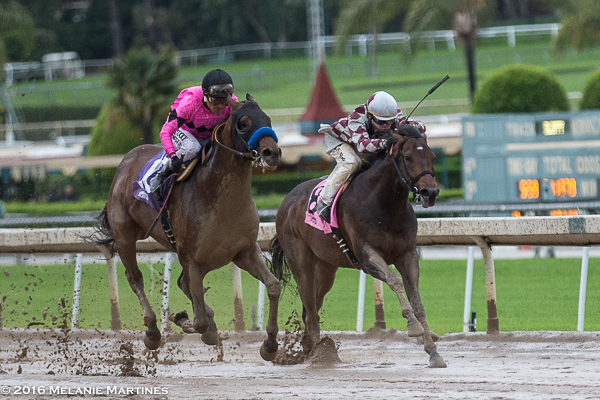 After the race I heard Jockey Tyler Baze comment, "All I can say is wow." There were many people saying she's going to be a special filly. Let's hope she will be. These grays are always easy on the eyes. If all else fails, just bet the gray! Trainer Philip D'Amato all smiles as this special filly thrilled the fans with her impressive win. He was also congratulated on Saturday for winning the Training Title for the meet; which is outstanding. 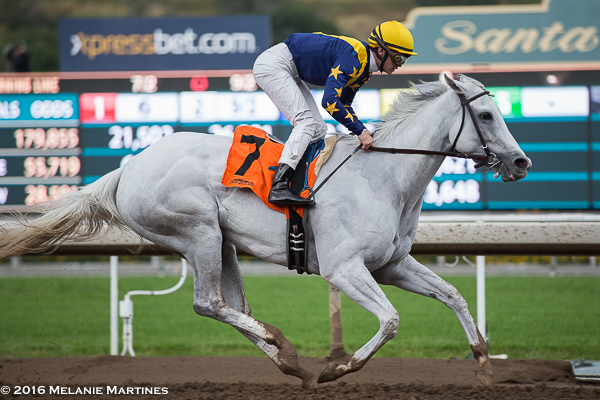 Last Stakes race of the Winter meet was the 78th Running of the Grade 3 San Juan Capistrano Stakes. 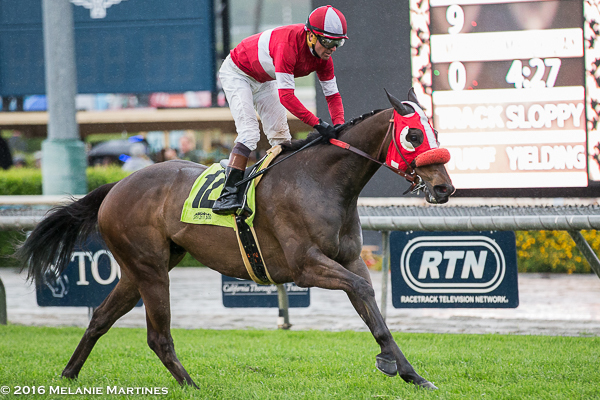 Making a bold move around the turn Jockey Tayler Baze and Quick Casablanca rallied home to victory winning by 2 3/4 lengths on yielding turf. Because of the rain, the race which normally has a hill side start ran on the turf oval at a first-ever distance of a mile and seven eighths. 8-year-old Quick Casablanca's Trainer Ron McAnally who is 83 won his first San Capistrano with the legendary Hall of fame gelding, John Henry in 1980. 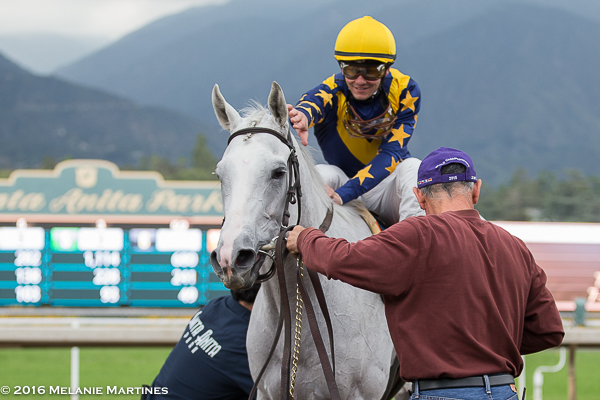 Trainer Ron McAnally, "He's an old horse, he's a pro. He's been around a long time. He's been to Chile, he's been to New York, he's been to Florida. He's one professional horse, and he's old like me." Despite the awful weather on Saturday it was an excellent weekend of racing. 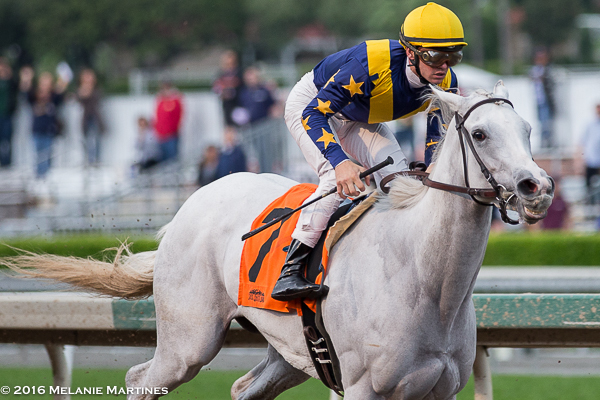 As we head into this weekend, all eyes will be directed to Oaklawn Park and the Running of the Arkansas Derby. With a million dollars up for grabs this race is all about the points with hopes and dreams of making it to the Derby. After this weekend things will really start to get fun and take shape as we get closer and closer to the first Saturday in May. 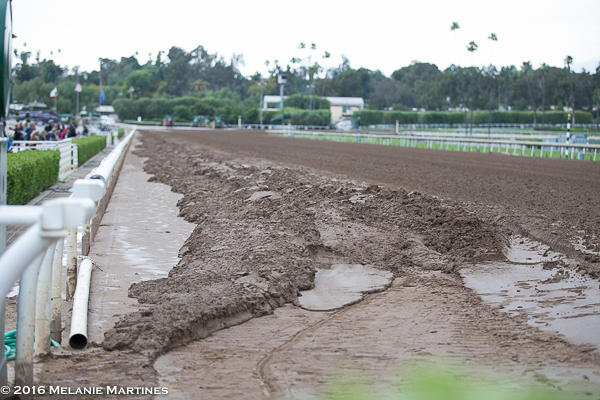 As Santa Anita Winter meet draws to a close it will reopen again on May 5th thru July 10th. It's always a thrill to visit the Great Race Place. We shall see you soon!